Deepavali Celebrations & Annakoot Darsahn ( October 17 , 2017 - October 20, 2017) : A grand Lakshmi Poojan was organized at Sri Ashta Lakshmi Bhawan on the evening of Lakshmi Trayodashi (Dhanteras) on Oct 17, 2017. Sri Sri Sri Ashta Laxmi Bhavan was decorated with lighting, rangoli, pushpamala during Deepavali. A group Laxmi (Sri Yantra) Pujan was performed at Sri Sri Ashta Laxmi Bhavan in holy presence of Pujya Sri Swami Adhyatmanandaji Maharaj and joined by priest Sri Kamlesh Jha of the ashram. On Diwali day grand Annkoot was offered to Maa Sri Ashtalakshmi. 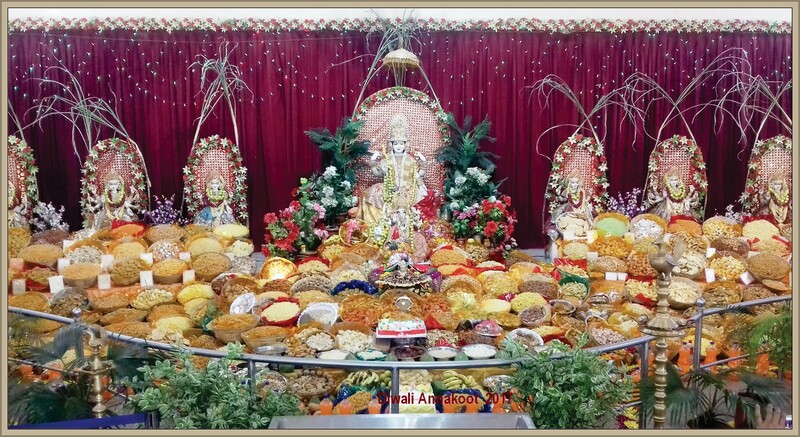 A few weeks of planning and preparations of about thousand varieties of food items by so many devotees culminated in Grand Annakoot offering to Sri Ashtalaxmi Maa on Deepavali day. A grand Annakoot food court was organized and dinner was served to the poor people at Sivananda Ashram. Entire day over thousands of people came to the ashram for the Annakoot Darshan and evening aarti on Deepavali and New Year day, as per Hindu calendar. Number of Saints and Acharya visited the ashram also. Number of TV channels and news papers highlighted the selfless services of Sivananda Ashrm. Srimad Bhagawat Saptah ( Oct 21, 2017 - Oct 27, 2017) : Srimad Bhagawat Katha commenced with devotees joined for "Pothi Yatra" carried Sri Bal Krishna in procession with traditional orchestra and dancing and singing in praise Sri Lallaji Maharaj. From the Vyasa Peeth, Sri Swami Adhyatmanandaji Maharaj graced the devotees, the nectar of Srimad Bhagawata for seven days. Pujya Swamiji gets absorbed in a different realm while narrating and singing the Glories of the Lord and make others experience the same. Dr. Naren Joshi, Mrs. Virbalaben Joshi and Sri Chidambaram Joshi were ardent devotee of Sivananda Ashram, Ahmedabad. Dr. Joshi served as a trustee of Gujarat Divya Jivan Sangh. All these three good souls departed in last ten years. In their loving memory, Bhagavat Katha was organized by daughters of Dr. Joshi; Smt. Kalpanaben Pandya, Smt. Shailjaben & Gayatriben. (SIVA) Sivananda Institute of Vedanta -Yoga Academy : As always, daily five Yogasana practice Classes and Two Yogasana - Meditation classes for beginners conducted and about six hundred new people participated these Yoga classes this month. Food for children through Narayana Seva, monthly grain distribution to the needy families through Vishwanath Seva Kendra, Daily Satsang & Puja Archana in the temples was performed at Ashram. Sunday satsang, Purnima’s Sri Satyanarayan Vrat Katha and Sri Lalita Sahasranam Parayana are regular part of the Ashram’s activities. Ahmedabad (Oct 1, 2017): On October 1st, Indian Red Cross Society, Ahmedabad organized get together of all Centurion blood donors and blood donation drive where thirty five people donated blood. They all were centurion blood donors and many of them were donating blood for 150th times or more. Revered Sri Swami Adhyatmanandaji Maharaj is also a Centurion Blood Donor. He is the only Monk, saffron centurion donor. H. E. Governor of Gujarat graced the occasion and he greeted all the donors by presenting a Red Rose. Gandhi Mitra Award Ceremony (Oct 1, 2017): Well known cafe of the town, "Vishala" organizes award presentation program every year. Revered Sri Swami Adhyatmanandaji has standing invitation. Also, H. E. Governor of Gujarat is invited for this function. "Gandhi Mitra" award is a prestigious award given to the people who, works selflessly in the service of poor, sick and down trodden in remote area, especially for education, nourishment, cleanliness and making their women folk self sufficient to survive independently by doing some craft work and so on. At Gandhi Ashram: On Oct 2, 2017 Birth Anniversary of Pujya Bapuji, Mahatma Gandhi ji, Sabarmati Gandhi Ashram organized all religion prayer meeting. Revered Sri Swamiji lead the prayer meeting by chanting Vedic hymns. The spiritual leaders from other religious organizations namely Muslim Community, Revered Arch Bishop of Gandhinagar, Ahmedabad, father Joseph Macwan spiritual head from Sikh, Jain, Buddha, Baha'i and Parsi all attended the meet. Leading Gujarat News Paper daily "Nav Gujarat Samay" community organized award presentation program at Kocharab Gandhi Ashram. Revered Sri SwamiJi Maharaj presided over the function and number of learned scholars and leading film stalwarts from Mumbai were awarded by Swamiji Maharaj. Program was conducted by Sri Ajay Umat, Principal Editor of the news paper. 25th AMA (Ahmedabad Management Association) week : Ahmedabad Management Association organized a week long program from Oct 3, 2017 to Oct 7, 2017. The theme of the talk this week was “How to live life of your dream ?" Revered Sri Sadhu Brahmavihari Das of BAPS, Brahma kumari Sister Shivani, Management guru Mr. G. Narayan, Revered Swami Anubhavananadaji and Revered Sri Swami Adhyatmanandaji were the speakers for this Silver Jubilee of Management Week of AMA. Inspiring talks by all were well received by audience. Sri Mukeshbhai Patel conducted ceremony in his usual witty style. The culmination was the last day discourse "Energize with Fuel of Motivation" by Revered Sri Swami Adhyatmanandaji Maharaj and it was concluded with spectacular Yogasana demonstration by Yoga teachers group of Sivananda Ashram. Pujya Swamiji received standing ovation in midst of thundering applause. Bharuch -Ankleshwar ( Oct 7, 2017): Honoring an humble invitation of Dr. C. K. Giriya, President of "Book Lovers Forum", Pujya Sri Swamiji Maharaj visited Ankleshwar for forum’s Bicentenary meet. Swamiji was invited for Forum’s 100th meeting also. Sri Swamiji stressed the importance of Swadhyaya, which now slowly and gradually missing from up coming generation. "Study of scriptures is must. It should be studied together as well as discussed also the points of eternity by readers. "Swadhyaya" awakens eternal unfading beauty of the SELF", said Swamiji. On his way to Ankleshwar, Sri Swamiji visited late Sri Mahendrabhai Shroff (Late founder President of the Divine Life Society, Bharuch) and had Satsang with members of Shroff family. Oct,12, 2017 World Sight Day was celebrated in a special way lead by Principal Revered Father D’costo and Revered Arch Bishop father Joseph Macwan. From Gandhigram Railway Station to Mt. Carmel School, more than 1000 young men and women walked blind folded by tying up black bandage on eyes. After conclusion of blind march, Swamiji addressed large gathering. In his address, Revered Sri Swamiji said, “Now we realize the value of sight. How difficult is blind walking through crowded street in the midst of heavy traffic. We have to have faith in the person who is holding our hand. Let us give our hand in the hands of Almighty Lord, have faith in Him and cross the ocean of Samsara". Revered Swamiji advocated volunteer Blood Donation while living and donate the organs after death. Swamiji said, “Donate your organ and bring the life in dying person." Vallabh Vidyanagar, Anand ( Oct 15, 2017): Lions Club District 3232 organized their district meet at Sri Sardar Patel Bhavan, GIDC, Vidyanagar (Anand). In his address, Rev. Swamiji said that to run an institute what is needed is commitment, dedication, devotion and determination. Unless and until one is not serious about his or her moral responsibility, no one can run institute in harmony and peace. Give love and responsibility to all new comers. Let them feel their potential and value in organization. Then, Institute will bloom. Delhi: On the way to Karnal (Oct 28, 2017): At Delhi airport, satsang was held by devotees on arrival of Pujya Sri Swami Adhyatmanandaji Maharaj and his team of musicians & singers. They were on their way to Karnal for Srimad Bhagavat Katha. A grand procession was organized on Oct 29, 2017 in the afternoon before the commencement of Sri Bhagawat Katha by Pujya Swamiji Maharaj on Vyasa Peeth at Sri Karneshwar Mahadev temple, Karnal. It will continue till Nov 4, 2017.